WASHINGTON ? Key members of the U.S. Senate CommerceCommittee are clearing the way for swift confirmation of four-time spaceshuttle astronaut Maj. Gen. Charles Bolden, the president's pick to lead NASA.Congressional aides say a confirmation hearing for Bolden, as well as formerNASA Associate Administrator Lori Garver ? the White House pick for the spaceagency's No. 2 slot ? could be scheduled as early as the week of June 8. One congressional aide said May 28 that Bolden's strongestally on Capitol Hill, Sen. Bill Nelson (D-Fla.), has asked the committee toschedule "something in the next two weeks." The Senate CommerceCommittee's top Republican, Kay Bailey Hutchison of Texas, said the panel wouldmove quickly to confirmthe nominees. "I believe the [Senate] Commerce Committee will moveexpeditiously to consider this nomination, and that of the nominee for DeputyNASA Administrator, Lori Garver, upon receiving their paperwork,"Hutchison said in a May 23 statement. The White House nominations, announced in a May 23 pressrelease, garnered widespread praise on Capitol Hill. NASA observerssaid President Barack Obama's selection of Bolden is a boon to the spaceagency's goal of furthering manned spaceflight and returningAmericans to the Moon at the end of the next decade. Many expect Bolden,who knows first-hand of NASA's effort to explore and understandthe universe, to be a strong advocate for the space agency's $8billion-a-year human spaceflight program. As a retired Marine Corpsgeneral, Bolden is seen as an inspirationalfigure who has overcome adversity early in his career, and who is expectedto bring an ethic of service to NASA's top post. Some political observers nonetheless speculate that Bolden'spast ties to NASA contractors could come up during his confirmation hearing. Inthe summer of 2005, Bolden briefly worked as a consultant for Minneapolis-basedAlliant Techsystems (ATK), the company that builds the solid-rocket boostersfor the space shuttle and which is prime contractor for the main stage of the Ares1 crew launch vehicle, a key component of NASA's planned shuttle replacementsystem. More recently, Bolden served on the board of Sacramento, Calif.-basedGenCorp, the parent company of Aerojet, a rocket and in-space propulsion firmthat competes against ATK and others for NASA business. Bolden left the boardin March 2008 having earned nearly $88,000 during his last full year ofservice. In January, the White House issued an executive order onethics that, among other things, prohibits former lobbyists in theadministration from working on issues they previously promoted, or at agenciesthey lobbied during their previous two years of employment. John Logsdon, a space policy expert at the Smithsonian'sNational Air and Space Museum here, says that because Bolden's involvement withATK occurred prior to Obama's two-year window for former lobbyists, it is onlyof minor concern. However, Bolden's tenure on the board of GenCorp may haveraised some questions within the administration. Consequently, there may be"some limited waiver where he doesn't get involved in GenCorp and ATKprocurement decisions," Logsdon said. While few question Bolden's and Garver's qualifications tolead NASA's front office, some said their nomination ? and the lengthy vettingprocess that preceded it ? illustrate how Obama's self-imposed constraints cankeep experienced, technical managers from joining his administration. "This is a problem with the ethics rules when it comesto technical issues," said Scott Pace, director of George WashingtonUniversity's Space Policy Institute here. "The community of reallytechnically qualified experts in any particular field can be very small, andthus it can be difficult to find experts who don't have a potential forconflict." In Bolden's case, the former astronaut and retired Marinegeneral entered the private sector during a period when companies wereencouraged to err on the side of caution, registering employees and consultantsas lobbyists even in cases where such activity might be limited. Bolden, in fact,protested his registration as a lobbyist by ATK during his brief service therein 2005, according to a Sept. 8, 2006, letter filed with the Senate Office ofPublic Records. 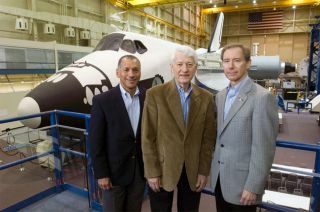 ATK spokesman George Torres said Bolden was among a handfulof astronauts the company paid to meet with lawmakers in Washington during thesummer of 2005 to provide "the operator's perspective" on using spaceshuttle hardware to build a shuttle successor. The visits coincided with a60-day study under way at NASA that ultimately produced the shuttle-derivedAres 1 and Ares 5 rocket designs. Garver, too, may have to answer for her ties to the spaceindustry. After serving as a NASA associate administrator for policyand plans during the Clinton administration, Garver cashed in her NASA andpolitical connections as a senior adviser for space at Avascent Group, astrategy and management consulting firm here. And while Garver does notregister as a lobbyist, her consulting work for numerous contractors seekingNASA business could raise questions. In addition, lawmakers could take issuewith Garver's husband, David Brandt, who works for Lockheed Martin SpaceExploration, NASA's biggest contractor. Sources familiar with Brandt's work sayit is limited to education and management activities associated with thecompany's Center for Space Exploration, a demonstration and exhibit facilitylocated in Arlington, Va. Political observers said the NASA nominees' past work withindustry could require that they recuse themselves from working on specificprocurements. But in Bolden's case, some type of a presidential waiver islikely since a blanket recusal from anything having to do with Aerojet ? asecond-tier contractor with hardware on a panoply of NASA programs ? wouldprove too constraining. "I expect to see [the waiver issue] come up in theconfirmation hearings," said Pace, who held senior posts at NASA and theWhite House Office of Science and Technology Policy under former PresidentGeorge W. Bush. "Some very limited and focused waiver may be necessary,but from what has been reported that would seem to be a minor issue." It is no secret that Bolden was not Obama's firstchoice for NASA administrator. Earlier this year the president settled onretired Air Force Maj. Gen. Scott Gration for the top job, though several keylawmakers, including Nelson, opposed his nomination. Steve Isakowitz, chieffinancial officer at the Department of Energy and a former senior NASA manager,was another presidential pick derailed on Capitol Hill. Some NASA observers assert the administration's nominationprocess was complicated by Garver, who emerged early as a top choice for thedeputy administrator position after advising the Obama campaign on spacematters and leading the president's NASA transition team. One source insideNASA attributed the lag in filling the top slot at NASA to White House concernsabout Bolden's service on corporate boards, including that of a company,Bristow Group Inc., accused by the Securities and Exchange Commission of bribingNigerian officials. The Houston-based helicopter services firm settled in 2007without admitting wrongdoing. But the NASA source also said Garver's appointment was anobstacle because the "nominee was required to accept Lori as deputy." While some view Garver's appointment as a White Houseattempt to position a loyal advocate in the No. 2 job, others said they do notbelieve she is being installed as a minder for NASA's top official. HowardMcCurdy, a NASA historian and professor of public affairs at AmericanUniversity here, says that while there may be a precedent for positioning WhiteHouse loyalists in NASA's No. 2 job, Garver is likely not playing that role. "There has been a history of putting a White Houseadvocate in the deputy's position to watch over the administrator,"McCurdy said, citing the appointment of former NASA Deputy AdministratorWilliam Graham during the administration of President Ronald Reagan. Graham wasa physicist with close ties to conservative White House staff members but hadlimited experience with civilian space prior to his appointment. His nominationwas opposed by then-NASA Administrator Jim Beggs and other senior NASA staff. "That was a real case in which the White House wantedsomebody in NASA to watch over the administrator," McCurdy said. "ButI don't think [Garver] is playing that role. She was an adviser to the campaignall along, and she represents the White House in that respect, but there is nota White House agenda being imposed on the agency." Brett Lambert, a managing partner at DFI International(since sold in part to Avascent) when the defense and aerospace consulting firmhired Garver in 2001 to lead its space work, said Garver's skill set ?knowledge of the space industry, Washington, and the inner workings of NASA ?should complement Bolden's military and manned spaceflight background. "With Lori, you have someone who knows how the sausageis made," Lambert said May 29. "Between the two of them, you've got agood team, as long as they are comfortable with one another." "When you're picking a team for the front office, youwant managerial skill, technical skill and political connectivity," hesays. "Charlie has the technical and managerial background, and Lori hasthe political and policy background, so between the two of them, it should begood."